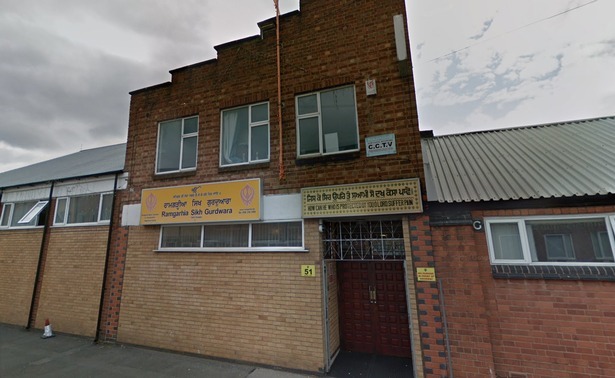 An old Sikh Gurdwara is to be sold in Leicester to help pay for a new Gurdwara. Worshipers are to leave the former industrial building in Meynall Road, Spinney Hills, for a new purpose built £4.2 million complex near the police station in Hamilton. The congregation of the Ramgarhia Gurdwara has outgrown the building that has been used for the past 50 years. Committee members have pushed the plans for the new Gurdwara which is currently being built and the move across is planned for October 2019. The trustees of the temple have now applied for planning permission from the City Council to for eight three-bedroom terraced houses on in Meynells Road and it is hoped the site could raise around £800,000. Trustee John Matharu said: “We aren’t going to build the homes ourselves but if we have planning permission for the site it will make it more attractive to developers and raise the value. He added: “Things are going well with the new building. “The entire steel structure is up now and we are sorting out the landscaping. The trustees are planning 500 trees both on the site and in other locations around the city and wider county as part of the project. The new Gurdwara will have a large ‘langar’ hall for dining, which will be big enough for 500 people, a ‘diwan’ hall for 600 worshippers to pray, a library, classrooms, an IT suite and a bridal suite. There will also be coach parking, 118 car parking spaces and cycle racks. The trustees have borrowed £2.1 million to part-fund the development. It has committed £800,000 of its own money and is seeking donations from Sikhs.